Talc as the definig mineral for the value of 1 of Mohs hardness it can be easily scratched by a fingernail. 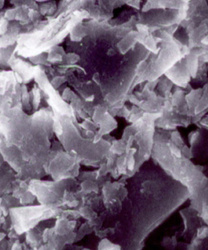 It has a specific gravity of 2,5 - 2,8, a clear or dusty lustre, is translucent to opaque. Its colour ranges from white to grey (or green, pink, blue, violet). Talcum powder is valued for its extreme softness, smoothness, high lubricating and hiding power and ability to absorb oil and grease. It is chemically inert to acids and alkalies. It has been found to be an excellent filler. It can withstand temperatures upto 1300ºC. It has low electrical and thermal conductivity. It can be easily powdered, cut and sawn into any shape and size. These properties in talc are of extreme value for various industrial applications as filler in rubber, textile, plastic, linoleum, asbestos products, polishes and soaps; as a loading agent for paper of all kinds; as a carrier of insecticidal and pesticidal dusts. Most of the rubber manufacturers use talc powder as a lubricant to prevent rubber goods from sticking.